Thank you Robert for your kind testimonial, and we wish you all the best in your trading! Join us for a FREE Seminar to get started immediately! http://synapsetrading.com/wp-content/uploads/2014/03/logo-header1.png 0 0 Spencer Li http://synapsetrading.com/wp-content/uploads/2014/03/logo-header1.png Spencer Li2015-11-25 08:30:532016-02-07 19:37:41Testimonial: "Key Examples and Setups to Start Trading"
Testimonials: “Disciplined System to Begin My Trading"
Testimonials: "Course Runs Through a Good Deal of Information"
A Warm Welcome to All Synapse Program Participants Flying in from Overseas! 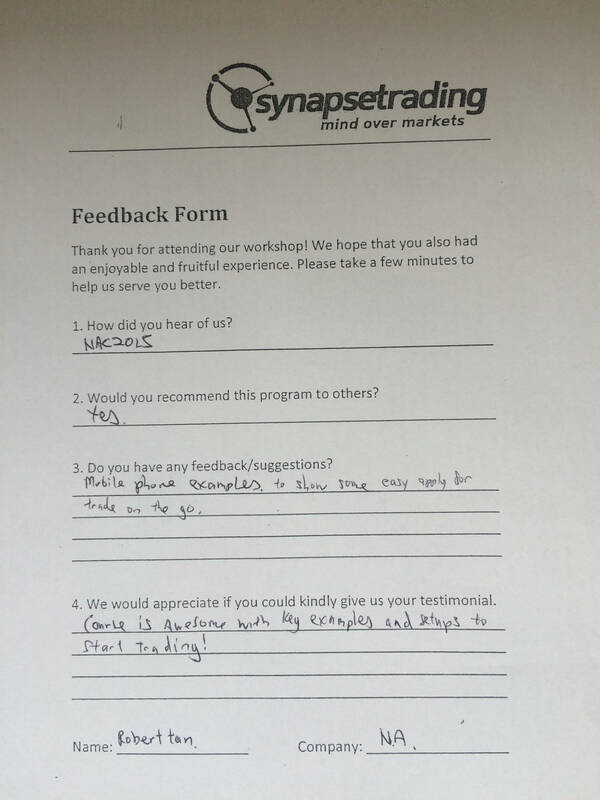 The Synapse Program Q4 2015 – Making Dreams a Reality in 2016!